So Cadence is off to W. Australia, other side of the country where she met Austin the first time round. James hates that she’s so far away and feels he’s scared her off by asking her to marry him. He’s such a lovely man, been through so much to be with her and I so felt for him. Poor Cadence too – its not as if she can explain. All her family and friends are mystified at her decision, and its so tough for her to try to justify her reasons to them, but she feels she has to go, she has to meet Austin again. She misses James terribly, and he’s so unhappy she wonders if she’s doing the right thing. But if she doesn’t then what about Austin, her first love and Melody, their daughter? They deserve a chance to live. Then she meets Austin and just as before falls in love. She’s so torn and to be honest I was angry with her at times, unfairly of course as she didn’t chose to be in this position, but it just seemed the way she’d gone this time round someone was going to get hurt with both James and Austin in love with her. The middle section where she has to lie to both is really gut wrenching, and that’s where I felt so angry at her. I can’t think of what else she could do though, she didn’t set out to cheat but has been forced into a position where she’s in love with two amazing men, and underneath she’s loyal to both though it doesn’t seem like it. Of course she can’t keep that secret forever and it causes some huge blowouts from family and friends. Its an incredibly emotional read, and I just couldn’t see how on earth Katie could resolve it without someone getting totally broken. 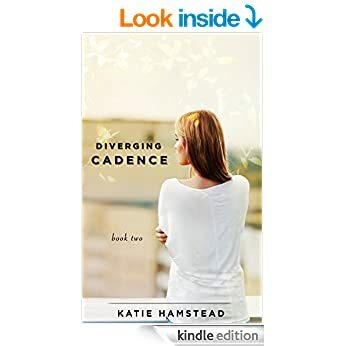 Even Cadence wasn’t without risk, whichever she chose she’d know that choice was responsible for the other one being heartbroken, and the consequences that could bring. and she truly loves them both. She knows what happened the first time though, and all this has been at an attempt to stop the events of that time round, but things keep changing and what seemed so simple when she started has become incredibly complex. She’s making decisions but so are others and they affect her choices too…. I shouldn’t have worried though, Katie does a superb finish, giving me the ending I needed but dared not hope for. There’s some surprises coming, things play out in a way I’d never imagined! These two books are a story I’d recommend for anyone who loves an angsty read, full of emotion, real people, issues lots of us face ( though without Cadence’s extra knowledge!) and a perfect, satisfying ending. Definitely one I’ll re read, and I know going straight through the two books will work far better for me than reading in separate parts. Thank you so much for taking the time to read y novels and write such a wonderful review. I truly appreciate it. I loved these books – I love to read but have no idea how you authors pull such wonderful stories from your minds, I’m just truly glad you do!